Basic Show (expanded) - click to download! 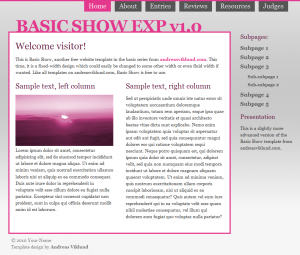 New version of the Basic Show template published, with a third column, refreshed navigation tabs, modified footer and a new colorscheme. The sidebar will be useful if you want to use the template on a site with more pages than the tab menu has space for. Okej, ska göra en felsökning och se vad det kan bero på. Prova att skicka till inbox@andreasviklund.com direkt, det borde fungera bättre!